Many will dress up as monsters, aliens, or politicians to scare or be scared. 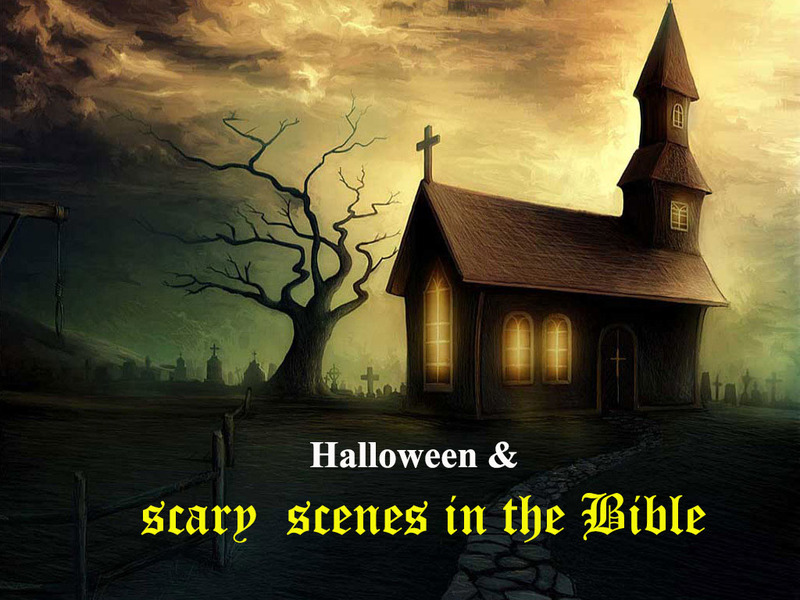 The Bible has many passages of strange and scary happenings. So today I will list a few scriptures to contemplate on Halloween. Daniel 5 What happened. What about the king sounds funny (6). What did the words mean. Does God still give us clear messages? How? Mark 6:45-51 – What is the scene? Can the disciples situation be compared to us? How? What about Jesus in verse 48 “would have passed them by”? Disciples reaction 49, how can verse 50 be a calming verse to us? Acts 12:1-2, 20-24 Who was Herod? Was he against God? Describe verses 21,22,23. What can we learn? 2 Kings 13:20-21 Elisha was a great prophet. What happened? Describe what you imagine happened? Acts 5:1-11 What is the story? What is the lesson? What is the truth we can learn? Are you ready for this day? It will be a day like no other. Prepare your heart to be take up to God at the trumpet sound. It will be a real and continuous nightmare for those left behind. Build your relationship with Christ to look forward to His coming and His Spirit will guide and cleanse your heart and mind to keep His Lightnside. We are in the season of political debates. I began to think about the situation King Solomon faced when he became king of Israel. 1 Kings 3:16-28 records a situation between two mothers. Both women just gave birth to a child. One night one of the mothers had accidentally turned over onto her child and killed him. When she discovered this she secretly switched her dead child for the living child while the other woman was sleeping. Verse 18 states they were alone in the house. No one could have witnessed the swap. In the morning when the ladies begin to nurse the innocent mother discovered the child she had was dead, but upon closer inspection she noticed it was not her child. So they came to Solomon to debate their case. Solomon had to decide which woman was telling the truth and which woman would be the loving mother of the living child. The debate began as both women told their story of what happened. I can imagine all who had heard these debates as they were told to lower judges there seemed to be no way to decide so the case went all the way up to the highest court. It would be decided here. An impossible case with no obvious evidence to convince truth. Both ladies claimed truth and both ladies accused each other. Before we discuss Solomon’s decision, let’s discuss an earlier decision of Solomon recorded earlier in the same chapter (1 Kings 3). Solomon had just become king after his father King David had died. The nation of Israel was large and the position of king overwhelmed Solomon. During a time of worship God spoke to Solomon and offered to give him any wish he desired. Solomon’s answer is recorded in verses 7-9. “Now, Lord my God, you have made your servant king in place of my father David. But I am only a little child and do not know how to carry out my duties. Your servant is here among the people you have chosen, a great people, too numerous to count or number. So give your servant a discerning heart to govern your people and to distinguish between right and wrong. For who is able to govern this great people of yours?” God was pleased at this request and gave Solomon great wisdom along with other blessings. Because of Solomon’s wisdom he was able to find a way to determine who the real mother was. Solomon asked for a sword to divide the living son and give half to each woman. Of course the real mother spoke up and said let the child live and give the boy to the other mother. Solomon said this mother’s compassion for the child has revealed she is the true mother and gave her the boy. The people were amazed at this wisdom. But the wisdom was not from Solomon’s learning but rather from God’s blessing. Remember the decision of Solomon was based on who would speak up to save the child. The one who had the boy’s life and future in mind even at someone else’s care was the real mother. As Christians we should vote for the one whom we believe will give hope to our families, religious freedom, national security and a desire for our nation’s future. Our nation that was built under God’s foundation of truth. During the debates and all the way to casting your vote, ask God for a discerning heart and to distinguish between right and wrong (1 Kings 3:9). Seeking God’s guidance in this troubled world will bless you and will place His Light-N-Side. This is the first truth Jesus spoke to the crowd of people seeking hope. Christ’s words seem confusing and conflicting in today’s world. Blessed are the poor?? Does that sound right? Let us look at the definitions of the words used then we will put them together to understand the truth Jesus shared. Blessed is another word for “happiness”or “fortunate”. We see someone who seems to be above all the pressures of life and is at peace we would say that person is “blessed”. Arn’t we all looking to be that person in this life. To find the answer to worry, fear and insecurity? To be blessed is seemingly a quality of existence and outlook on life that finds joy and satisfaction in any situation. Poor – the Greek word ptōchos (po-huas) – beggary, asking of alms, palper, poor. The image is of a beggar who has nothing and his only means of survival is at the mercy of others. Image these two words together in one sentence. Talk about an oxymoron! It belongs with other combinations like “jumbo shrimp”, “good grief”, or “the silence was deafening”. These two words do not seem to make since on the surface but there is a truth involved here that is profound and a sign of God at work. Since Adam’s sin darkness has ruled the hearts of men. It has ruled the spirit of a man. the spirit part of you is the reasoning, thinking, and feeling part of you. It is the part that justifies your actions and determines your self worth. Sin always builds it’s self up. We become self righteous and proud of our achievements and abilities. However in this pool of self righteousness sin sets up addictions, anger, jealousy and other dark thoughts and emotions which lead to sinful actions. When Jesus spoke – His Spirit (the Holy Spirit) spread through that whole crowd and the hearts of men were awakened. A sudden awareness of the presence of Holiness laid bare the lack of holiness in man’s heart. Just like in Luke 5:1-10 Jesus spoke to a crowd using Simon’s boat. After the message Jesus asked him to go back out into the lake and fish. Simon said “we have fished all night and caught nothing” (which is an illustration of an empty life without Christ), “but at your command we will go”. They went out and suddenly an abundance of fish were caught. Notice the effect this realization of Holiness had on Simon in Luke 5:8 “When Simon Peter saw this, he fell at Jesus’ knees and said, “Go away from me, Lord; I am a sinful man!” Jesus said your life is about to change course for the better. When Jesus began to speak the very first sign of awakening to the new life in Christ is an awareness of our own need. An awareness of our own emptiness of righteous. It is that poor in spirit that brings us to the cross in need of Christ’s forgiveness and cleansing. It is good to be poor spirit. It is blessed to be poor in spirit. It is wonderful to know Christ is a river of Holiness that will poor into our empty hearts the life and light of God and truth. Come to a place in His presence where you say “I am a sinful man and do not desire your mercy” and watch Christ reach out to you and put His light-n-side. Jesus begins to bring hope to a lost world in Matthew 5. It is said you can give a fish to a man and feed him for a day or you can teach him to fish and feed him for a lifetime. Jesus did not come to earth just to heal the effects of sin on mankind’s body. We see him before Matthew 5 surrounded with large crowds of people who are broken physically, mentally and spiritually. Jesus reached out and healed them all. Then Jesus began to teach as He spoke works of life to the crowd. He began to teach kingdom truth that would equip men to become mighty in their own spirits through Christ to overcome the chains of sin and destruction in their families. Jesus began to speak with the same voice that created the universe. Out of Christ’s heart and through His mouth holy words of truth poured forth. The spirit of Christ spoke to those who heard him that day and their spirits began to awaken in the presence of the creator. Jesus began to describe the process of one’s spirit as he begins to journey from the chains of sin and selfishness to one who becomes one with Christ as an overcomer of sin. That day Jesus transitioned from healing a man to teaching him truths that would bring continued healing and health in his spirit. Let us become mighty in Christ by hearing and receiving truth. Not one who is always looking for God to heal them but rather to BECOME Christ-like with healing truths inside. It is not easy but it is very much worth the effort. Follow along as our spirits come alive and we BECOME Christ like by learning Christ’s BEATTITUDES. Blessed are the poor in spirit for theirs is the kingdom of heaven. Matthew 5:3 May God awaken hope in you today to receive truth from His word. May it become Light-n-side.